In Greek mythology, Cepheus was considered to be the King of Ethiopia, who was one of the famous Argonauts who accompanied Jason on his quest for the golden fleece. 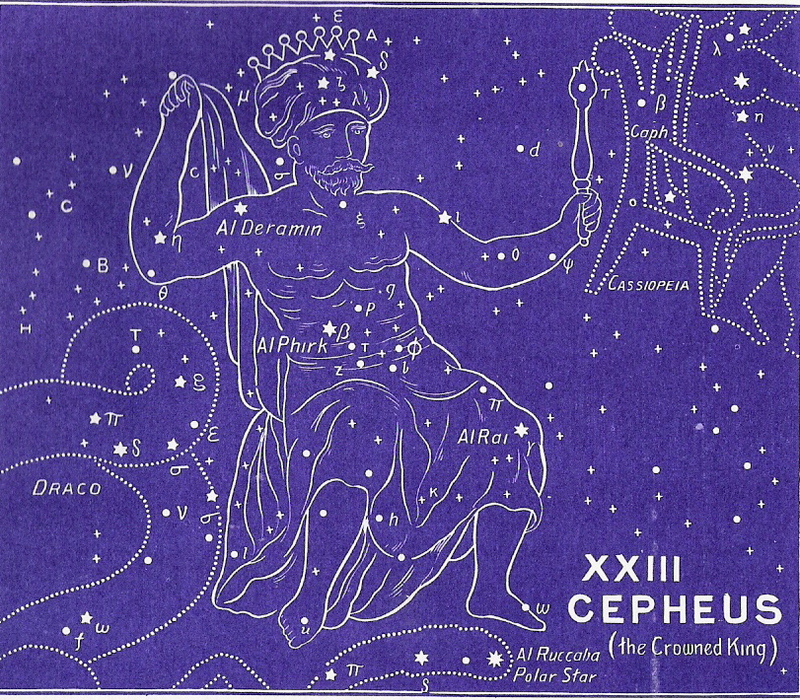 Cepheus is depicted on the old star charts as a king holding a scepter in one hand and a robe in the oth er. The ancient Chinese culture also regarded this region as representing royalty. The Arab culture, however, regarded this as a pastoral (country) scene of a shepherd guarding his sheep. The truth is that this does represent the Good Shepherd that came as a King, though He was rejected. With Cepheus, we finally see the end of all this conflict, and that end, dear friend, is victory! First, with The Band, we saw the reason for our conflict — we are tangled up and bound to the three sources of sin (world, flesh, and Devil). Then with Andromeda, we saw the possible result of that conflict — complete helplessness on our own and complete dependancy on Christ. Finally, with this third decan of Pisces, we see the resolution of this conflict — and, in the end, there is victory! The star picture is of one who, in regal robes, is slowly rising. He is holding a scepter in his left hand and robes in his right. Notice that his footstool is Ursa Minor (the Little Bear). We will discuss the significance of that later. Please take a moment to read the Birthright vs. Blessings page. Cepheus is a king who is holding the scepter in his left hand (the hand of the birthright) and robes in his right hand (the hand of blessing). It is an interesting study to understand the difference between these two. He appears to be ready to fulfill both the offices of birthright and blessing. In other words, He is coming as both a spiritual and political ruler who will bring about a perfect culture. There is another facet to this birthright and blessing that you will see when we get to Cassiopeia. Which leads us, again, to the fact that He is slowly rising. There are several reasons that are possible for why He is beginning to stand up. If we keep in mind that we are ending the chapter of conflict, and that He is our victory — then it would be a wonderful interpretation to think of Him standing in our defense. Our victory certainly isn’t in our strength (see Andromeda) — but we have a hope! Believers are promised that they have an Advocate who daily pleads on our behalf before the throne of heaven. So, Cepheus (representing King Jesus) could be standing in our defense! What an amazing thought! Pay careful attention to the meanings of the names of the stars. They will always back up the message of The Gospel Truth above. To continue in the correct order of the ancient star chart, please select Aries next. Be sure to download your copy of the Free e-book that discusses the historical, cultural, and biblical evidences of this star revelation.